POWER CLEAN Heavy Duty Degreaser Concentrate offers a safer alternative to hazardous cleaning chemicals, such as mineral spirits and caustics. A successful business must have environment-friendly practices as well. POWER CLEAN is fully committed to ensure that your cleaning needs and requirements are taken care of with safe and eco-friendly cleaning products. POWER CLEAN offers a range of biodegradable degreasers that are tough on stains and dirt but safe for your workers and the environment. We offer a series of aqueous cleaners / degreasers that are best in their class in terms of efficiency, yet they will not cause any major dent in your budget. POWER CLEAN XL is an all-purpose industrial cleaner / degreaser concentrate that is designed to replace hazardous and toxic substances such as trichloroethylene (TCE), Perchloroethylene and other caustic chemicals. With the same or even better level of cleanliness along with safety to the worker, equipment and the surroundings, this water-based degreaser is your best bet. Use POWER CLEAN NF to clean equipment and other products made of soft metals such as aluminum, brass, bronze, nickel and copper. It is specially formulated to prevent discoloration, stain marks and white rust. If you are looking for a special purpose aqueous cleaner / degreaser with low foaming and additional corrosion protection for cleaning the metals, then POWER CLEAN SP is your product. 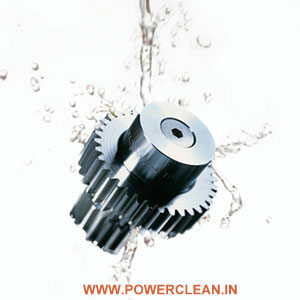 POWER CLEAN LF is a water-based cleaner designed for high jet spray applications with low / no foam cleaning for metals. To clean up the carbon deposits from engine components quickly and effectively, we have POWER CLEAN Carbon Remover [CR]. POWER CLEAN GC is glass cleaner concentrate that can be diluted to make up to 4 liters of ready-to-use product for cleaning the dust, dirt and spots off glass surfaces. We even have water-based cleaners for your housekeeping needs that will help you keep you premises faultless and fresh. POWER CLEAN FL is designed to clean up tough stains, oil and grease from industrial floors, shop floors, machine shops & service center floors. We guarantee all our products for the highest quality.